We all know a wedding is a time for celebration; however, even at that most special moment, each couple can choose to honor a family member or close friend who has passed on prior to their wedding. 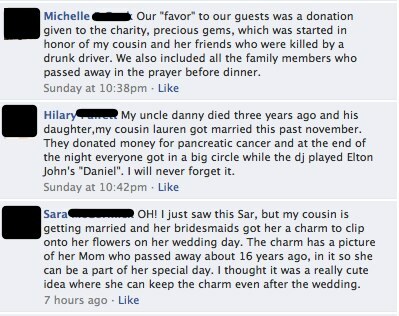 Whether the passing was recent or a few years back, you can feel it in the air when the person is honored. But it's always beautiful to see how the couple chooses to do this. Because this is so personal I decided, I will share how we honored those in mine and Jason's life who have passed on. We honored three people on the day of our wedding: my brother, Bobby; my aunt, Dolores and his Grandmother, Frances. 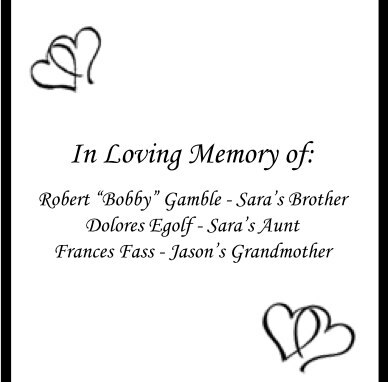 They were mentioned in name during the ceremony, in text in the program (see below) and we placed a single red rose in a vase on a chair with a black cover at my parent's head table for my brother. While there are many points throughout the day to honor those who have gone before us, in truth, I feel at the ceremony is the best place to go. It's where everyone is the most solemn and the most concentrated on the moment...the reception is the time for drinks, food and dancing. While roses may be deemed by some couples as overused, personally, I think they are the most amazing symbol of honor and respect. Other flowers are just as gorgeous - but really, this blogger is biased. You can place a single flower in a vase in the front rows at the ceremony - or at the reception, a small flower can be placed on a chair in a silent symbol of your loved one. We feel the warmth of your smile. and the memories we have shared in the past. you have made upon our lives. We have all heard the songs of a lost loved one - here are a few that I think are the most powerful. Feel free to use them in the ceremony, reception or the words in other ways. Creativity is encouraged! Any song that reminds you of your relationship can be just as important. PS don't judge if these songs are old...they are still great and my iPod is way out of date. And all the links take you to YouTube! We have heard of couples wearing or having a part of their loved ones on their person on the day of the wedding. 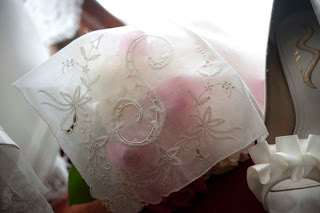 Some brides have worn their mother's or grandmother's veil (sometimes dresses) - or they can have something like a sash made of the material. Grooms can also wear their father's (or grandfather's) tuxedos or cufflinks. While shoes may be a reach given the wear and tear but we cannot forget about the jewelry whether it's the engagement or wedding band; a locket or a set of pearls. As mentioned previously, a donation in honor of a loved one to a society that they worked for or if they passed away due a disease - there is no better way to show your support in finding a cure. Whether it's the person's favorite poem, mentioning their name in the Prayer of the Faithful (Catholic Rite), reciting song lyrics or saying a few brief words...Words are powerful and moving and can be an amazing addition to your day. However you do choose honor the person who is no longer with us, it will always shows how beautiful their life was - and how you choose to carry on with them by your side in spirit.